Hey guys, it’s been a while, right? Sorry for the absence, but this weather is killing me. Severe weather changes affect me strongly, so much so that I’ll just sleep and do nothing and barely keep alive. Ok, exaggerating, but you get the idea. So it turns out I am not only sensitive to snowing, but strong winds mess with me as well. So I’ve been just laying low the past couple of days, feeling miserable (again) and just taking it day by day, and sleeping a lot. Like a LOT. Just work and home to sleep. And I hate it. 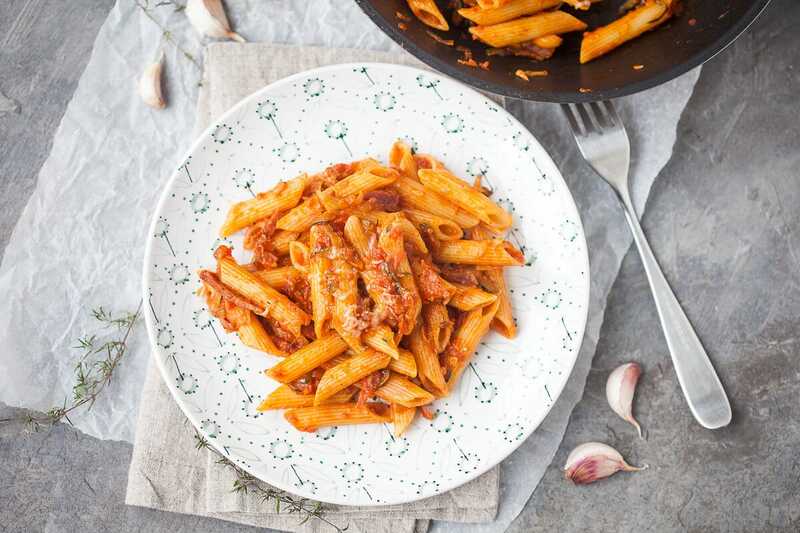 When you need a little kick make this 15-minutes Spicy Penne in Tomato Sauce with Salami. Fast & Easy winter recipe for two. Peel and slice onion and garlic. Wash and dry half a zucchini, then grate it coarsely. Roughly dice a few slices of salami. Wash, dry & chop fresh basil leaves. 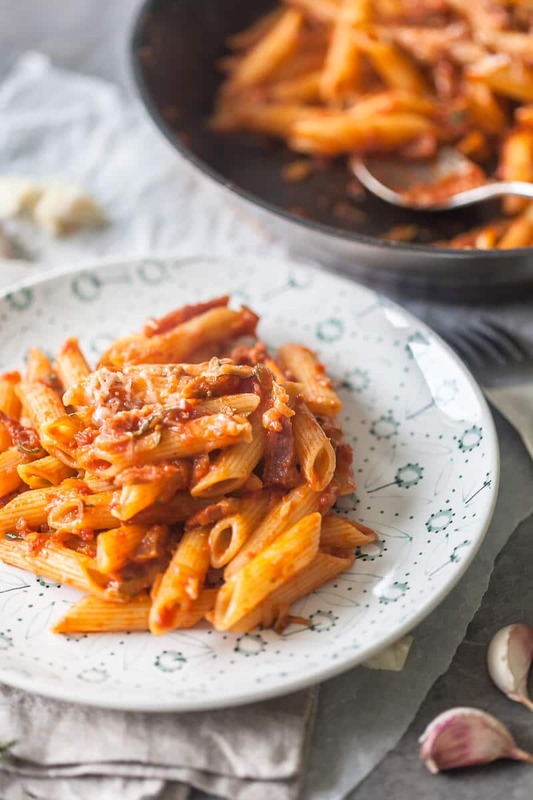 Bring a pot of salted water to boil, then add penne pasta and cook according to package instructions (should be about 11 minutes to al-dente). While the water is heating & pasta is cooking, preheat 1 tbs olive oil in a pan. Add sliced onion and fry until translucent. Add garlic and diced salami and stir-fry for a minute or two. Add grated zucchini, then add canned tomato and bring to a boil (rinse the can with a splash of water and add it to the sauce). Season to taste with salt, fresh ground black pepper and ground chili flakes. Bring to a boil and let it simmer on low for about 15 minutes, stirring occasionally. When the sauce is reduced and thickened, it is ready. Add chopped fresh basil leaves. 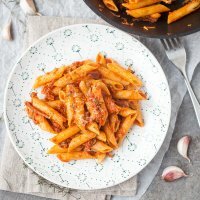 By now your pasta should be cooked as well. Save a cup of pasta water, then drain the pasta. 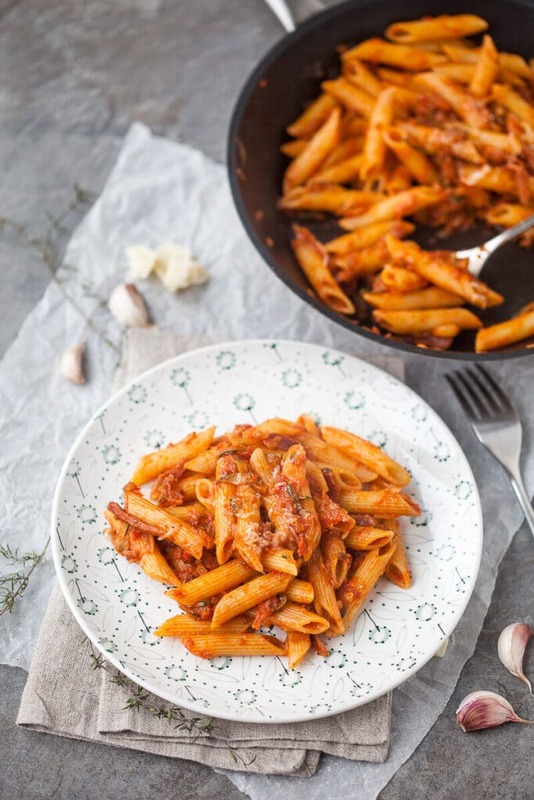 Immediately return the pasta to the pan with the tomato sauce and add a splash of pasta water. Combine well and serve topped with grated fresh Parmesan cheese.